From here, let us take the story further because this was one of the first great victories for Tawheed in that time – and we shall explain how Tawheed was established in that region. Shaikh Muhammad Ibn Abdul-Wahhaab (rahimahullaah) presented the da’wah to the Ameer of ‘Uyainah. The ameer accepted the da’wah and he aided Shaykhul-Islaam Muhammad ibn Abdil-Wahhaab to establish the da’wah in that village first. So Shaykhul-Islaam began to rectify the evils and correct them, he destroyed the shrine and the dome that was erected over the grave of Zayd ibn al-Khattaab – so with the aid of the ruler (after Allaah), he demolished the shrine that was erected over that grave. He didn’t destroy the grave itself, because of course a person is buried in the grave. So he didn’t destroy the grave, he levelled the graves, in accordance with the statement of ‘Alee (radiyAllaahu ‘anhu) that the Messenger of Allaah (sallallaahu alayhi wa sallam) said to me, “Do not go past a grave except that you level it, and do not go past an image (or statue) except that you efface it.” So this was a command of Allaah’s Messenger (sallallaahu alayhi wa sallam) that one should not build places of worship and structures over the graves. So when he spoke to the ruler, Ameer Muhammad al-Mu’ammar, he said to him: If you agree and if you allow Tawheed to be established within this region, then allow me to eradicate every avenue that leads to shirk. So the people are worshipping at the grave of Zayd ibn al-Khattab (radiyallaahu ‘anhu), will you allow me to demolish the shrine over it and prevent them from worshipping there? He said: Yes. So he went ahead and demolished it and he levelled the grave – just as it was originally when Zayd was buried. The people used to travel to that grave, to this shrine and thus Shaikhul-Islaam demolished the structure over it so as to stop the innovated journeys to the grave and seeking aid from the inhabitant of the grave. He established the prescribed punishment for fornication and he stoned the adulteress who had confessed. An adulteress came to the ruler and she said that she had committed adultery. So the case was given to Shaykhul-Islaam Muhammad bin Abdul-Wahhaab (rahimahullaah), because she had come to him confessing, so he said (seeking to find her an excuse), “Maybe you were raped?” She said, “No.” He said, “Maybe it was your husband that had returned?”. She said, “No, he didn’t.” He said to her kinsfolk, “Maybe she is insane and thus excused for her behaviour?” So he asked the people, “Is she insane?” They said, “No.” She said, “Rather, I just want the legislated punishment of Allaah to be established.” So then upon that, upon her confession, she was stoned to death. So he established the prescribed punishments under the ruler of ‘Uyainah as prescribes punishments cannot be established except by the ruler in authority in his land. This map shows the full extent of the Ottoman Empire at its peak proving that they never controlled Najd and much of Arabia. So then, Ibn Mu’ammar, he presented to the shaykh that which had reached him from the threats. So Shaykhul-Islaam Muhammad ibn Abdul Wahhaab said to him: Let me put your heart at rest, whatever is with Allaah from rizq is better for you than whatever they give you and it is upon you to trust in Allaah and Allaah is sufficient for the one who trusts in Him. And Allaah will enrich you so that you will not be in need of anything that they give you. So then he kept admonishing him and encouraging him not to be afraid of them: You don’t need them, you don’t need their wealth, establish the Tawheed of Allaah and Allaah will give you success. However, Ibn Mu’ammar was not satisfied and he was not content, so then eventually he said to the shaykh that he must leave or he himself would be harmed. So he expelled and exiled him from the town of ‘Uyaynah. So what could the Shaykh do now? Wherever he strives and calls in the cause of Allaah (the Most High), ahlul-bid’ah and the enemies plot against the people of Tawheed. So they turned him out again, and the Shaykh left – and where did he go? He went to Dir’iyyah and the Ameer of Dir’iyyah was Muhammad bin Sa’ood (rahimahullaah). He was the Ameer just as the others were Ameers. It wasn’t as if he had control over the whole of Najd, he had control only over the town of Dir’iyyah. If one travels to Riyaadh now in these times, Dir’iyyah is just on the outskirts of Riyadh – of course in those days it was a bit further away but due to the expansion of modern Riyadh, it is now on the outskirts of of the capital. Till this day, you will see the houses there as they were during the time of Shaikh Muhammad Ibn Abdil-Wahhaab and Imaam Muhammad Ibn Sa’ood, their families, students, children and grandchildren and so on. So Muhammad bin Sa’ood was the leader and Ameer of that town, he was upon what the other leaders were upon, and what were they upon? They were upon just controlling the village and area that they were living in, anyone that encroached upon them would be fought. They believed in what the rest of them believed in, in terms of going to the graves and sacrificing at the graves and so on. So they would hear that this Shaikh is coming and he became a name that was heard by the people, so they heard that he was coming to Dir’iyyah. Now Shaikh Muhammad bin Abdil Wahhaab was coming to his village – and he entered Dir’iyyah and he went to one of his students Ibn Suwaylim (rahimahullaah) and he stayed as a guest with him. He remained there at his home, as he considered his options and the da’wah and what to do – he remained there for a while. Then the wife of the Ameer – and this is where the role of good women is important, the wives of the righteous men, men who have strength and authority – she was the wife of Ameer Muhammad ibn Sa’ood. So the wife of the Ameer was aware of the arrival of Shaikh Muhammad bin Abdul-Wahhab and Allaah guided her to Tawheed – she heard the teachings of Shaykhul-Islaam and she accepted them just as two of the brothers of Muhammad bin Sa’ood. So Shaikh Muhammad (rahimahullaah) stayed there and taught, and the da’wah moved her and affected her. She heard the da’wah and she had embraced it. She abandoned innovations, shirk and grave worship and whatever else the people were doing of superstitious practices – may Allaah have mercy upon her. So she went to her husband, the Ameer Muhammad bin Sa’ood (rahimahullaah) and look at what she had said to him, she said to him, “O my husband, this scholar who has come to your land, it is a blessing from Allaah that he is here, it is a blessing of Allaah upon you, so take it before it is given to someone else instead.” Meaning, if you let him leave this town then the blessings and bounty of Allaah will be given to other than you, so take it because he is calling to the haqq, the truth, he is calling to Tawheed and Sunnah. She continued up until she convinced her husband to come to Tawheed and the Sunnah and to abandon bid’ah. So he said that he will accept, and that the Shaykh to come to him. He was the Ameer the shaykh should come to him. Now look at this woman, his wife said: No my husband, if you request him to come to you, the people will say that you are about to punish him or kill him, rather you should go to him because he is the man of knowledge, he is the Scholar – you are the Ameer, but he is the ‘Aalim. The scholars are the ones who are travelled to, so go to him, be with him and benefit from him, so the people will then respect knowledge and they will respect the people of knowledge. Look at this woman! This is the sign of nobility, this is a noble woman, the wife of the Ameer, yet she advises her husband to go and sit with the ‘Aalim and benefit from him. This is the effect that the righteous woman can have upon her husband, a husband that initially could have been misguided. This is why we keep mentioning, that every woman should follow the Book and Sunnah and follow the Sahaabah, just like the men. If the man is upon the truth, then alhamdullillaah, she’s upon the truth, then what if he goes astray, will she follow him too? This is not the characteristic of a righteous wife. The characteristic of a righteous wife is that she is upon the truth and upon piety regardless of her husband. If her husband is upon the truth then alhamdullillaah – if her husband is not upon the truth, then she remains steadfast upon the truth and she does not follow him into misguidance – look at the example of this wife of the leader of Dir’iyyah in Najd. Shaikh Saalih Al-Fawzaan mentioned: “Look at her sophistication and her political astuteness as a wife.” So the Ameer went to the house of Ibn Su’aylim. Ibn Suwaylim was afraid for the shaykh when the ameer arrived, he could kill the Shaykh but the Shaykh said, “Bring him and let him sit.” So he sat and Shaykhul-Islaam Ibn Abdul-Wahhaab sat with him and he called him to Allaah, to Tawheed and the Sunnah. He warned him from shirk and from the falsehood of what the people were doing, he warned him away from innovations and misguidance – and after that sitting, the Ameer of Dir’iyyah was convinced of the da’wah of Shaykhul-Islaam Muhammad ibn Abdul-Wahhaab (rahimahullaah) and he accepted the da’wah. Then he promised the Shaykh, “By Allaah I will aid you. Where others have left you, I will aid you.” So he made a pact with the Shaykh and he made an agreement with the shaykh and from that moment on, the da’wah to Salafiyyah that had come close to being extinguished in the time of Shaykhul-Islaam Ibn Taymiyyah centuries earlier was to be revived in that small village of Dir’iyyah – and that is the aqeedah of Ahmad Ibn Hanbal, rather it is that which the Messenger Muhammad (ﷺ) was sent with. So this is where it began by the permission of Allaah, the Most Perfect and Most High. The da’wah was established in that village and the Shaykh sat down to teach, to give advice and start writing his books. It became such that the students of knowledge would travel from the various parts of the Arabian Peninsula and beyond – and those that came would be given housing and shelter by Ameer Muhammad ibn Sa’ood (rahimahullaah) to stay and study with the Shaykh. So not only did he give him free license to teach but he said whosoever comes, I will shelter them also. So imagine the strength of one man, that Allaah (the Most High) raises, a man who does not fear the blame of the blamers, who stands for the truth even if he is beaten, just like the Messenger of Allaah (ﷺ), when he was beaten, strangled, boycotted and expelled yet he never gave up hope. His desire was to act upon the truth and he remained upon that. Shaikh Muhammad bin Abdul-Wahhaab was tried just as the Scholars before him were tried. Shaykhul-Islaam Ibn Taymiyyah (d. 728H, rahimahullaah) was imprisoned in his time and died in prison. It did not stop him: Shaykhul Islaam Ibn Taymiyyah, when he was put in prison, he continued giving da’wah up until even the prisoners started following him in the 7th century. The prisoners’ incarceration would come to an end but they would not want to leave their Shaykh! They wanted to stay with their Shaykh and study further. This is the fruits of the da’wah of those who are steadfast upon the Book and Sunnah – whether they are beaten, boycotted, expelled or imprisoned, their da’wah sincerely for Allaah’s sake does not cease. Likewise with Imaam al-Barbahaaree (d. 329H), and the same with Ahmad ibn Hanbal, for nearly two years he was imprisoned, beaten and tortured, and by Allaah, the man could not be stopped! So this is Shaykhul-Islaam Muhammad bin Abdul-Wahhaab in that tradition of the inheritors of the Prophets of Allaah. So after that, Shaykhul-Islaam Muhammad bin Abdul-Wahhaab began to write letters and treatises to the various lands, the various people, the various regions, even as far as Morocco and the Maghrib; to the leaders and the learned men of those lands. Some of them would enter into Tawheed after once being upon shirk and bid’ah but most would not. However, that did not stop him from writing, he would write clarifications when doubts and fasle rumours would be spread – and there plenty spread by the enemies of the da’wah: “These people of Dir’iyyah declare Muslims to be kuffaar”, so the shaykh would write a treatise refuting those individuals who would accuse him of making takfeer. They would accuse him of all types of falsehood. So he would write and respond, removing the doubts, he would write book after book. He would send them to the various regions and remember this is the time when there are no printing presses. They would write and others would copy and send them out to the various places, so in that way the knowledge would be spread. He wrote Kitaabut-Tawheed (The Book of Islamic Monotheism), Al-Usooluth-Thalaathah (The Three Fundamental Principles of Islam), Usoolus-Sittah (The Six Foundations), Khushfush-Shubuhaat (Uncovering the Doubst), Qawaa’id al-Arba’a (The Four Principles), Masaa’il Al-Jaahiliyyah (The Matters from the Days of Pre-Islamic Ignorance), Mukhtasar Zaad al-Ma’aad (A Summary of this tremendous work of Ibn Al-Qayyim (d. 752H), Nawaaqid al-Islaam (The Things that Nullify Islaam). All of these books and many more are preserved and widespread till this day. So then Ameer Muhammad ibn Sa’ood formed an army for the purpose of Jihaad. Why? Because the enemy became strong and realised that Dir’iyyah is becoming stronger, people are travelling to it, it is becoming a centre of learning – he realised that he had to protect it because now the enemy was going to attack and they were already making skirmishes against Dir’iyyah. Shaikh Muhammad bin Abdil Wahhab and Imaam Muhammad bin Sa’ood would send out du’aat to various villages to teach the people in those villages. They would send students of knowledge and scholares, not like Jamaat At-Tableegh who send ignorant people who have no knowledge of Tawheed and Sunnah to knock on doors and invite them to emptiness. Rather, these students and scholars would teach – they would learn the knowledge of the Kitaab and Sunnah, Tawheed, ‘Aqeedah and establish this. Then they would go out and give da’wah. So imagine a man would come from a village, sit with Shaikh Muhammad bin Abdil Wahhab for a few years, and then go back and teach the people in his village. So imagine what effect that would have on people who were worshipping graves, who would sacrifice animals in front of caves. The students of the Shaykh would teach and quote from the Hadeeth and Aathaar of the Sahaabah, quoting from books like Kitaab at-Tawheed which is not something that these people could oppose. So then some of those villages, their leaders and their people became threatened and they started plotting and planning against Dir’iyyah, against Imaam Muhammad bin Sa’ood, who was now the guardian and vanguard of Salafiyyah in his time, because he had the strength, the authority and he was the leader. So he built an army that would guard and defend Dir’iyyah and Salafiyyah. Those that would harm and kill emissaries and peaceful teachers, the Ameer would send an army after them in defense of the emissaries who called to Allaah. So when a preacher would go to his village to spread knowledge, if he was attacked, he would call for the army, to protect and defend the Tawheed that was being spread in these places. So they entered into villages, they carried the da’wah of Tawheed and Sunnah, they carried it to the townships and one by one, those townships entered under the rule of one ruler, the Ameer Muhammad bin Sa’ood (rahimahullaah). So the whole of Najd came under the rule of Muhammad bin Sa’ood, so why do the enemies of Salafiyyah have a problem with that? A land that is ruled by fifty or sixty different rulers, one area, one village, divided into four quarters, each with a king?! First they come and teach them Tawheed, then they come and establish Tawheed in that land because the people want the Tawheed, and then they come and establish the rule of Allaah in that area – that is what the people wanted. Why would anyone have a problem with that? Why would they hate Imaam Muhammad bin Sa’ood for uniting the people under one banner? The banner of “laa ilaaha illallaah”. It shows you the enmity of those people in our times against Tawheed and the Sunnah – and they even belie their own claim of desiring only one ruler! Here is one ruler but they do not want it. Even to this day, in their books and speeches, they say Imaam Muhammad bin Sa’ood rebelled against the Ottoman Empire. What Ottoman empire?! They themselves in their records say that the Ottomans were never in Najd, Najd was not under their rule. The establishment of the da’wah of Tawheed and Sunnah, the demolition of the domes, this is what hurts them the most. These armies would go out and demolish the structures and domes where people would pray to the dead and the Jinn, to prevent them from worshipping at those places, this is what hurts them (the Sufis and Raafidah) the most until this day! The reach of the Ottomans at their peak proving Ibn Abdul-Wahhab did not rebel. If there was a tree that they would worship, the Muwahhidoon (the Monotheists) would cut down the tree. This had happened in ‘Uyaynah – Shaikh Muhammad bin Abdul-Wahhab had sought permission from the ruler to establish Islam and the ruler gave him permission, so he cut down a tree where women would come and seek blessings. So in this period, the army was established in the path of Allaah, the dawah had been established, from that one small village of Dir’iyyah in Najd in Arabia – and that was the establishment of the first Saudi State. They continued until the whole of Najd had come under the control of the Ameer Muhammad bin Saood (rahimahullaah). In this period, the people of evil started spreading wicked rumours. Shaykh Saalih Al-Fawzaan mentions that they started saying “Ibn Abdul-Wahhaab wishes to change the religion of the Muslims. He has come with a new religion that has never been known before, and he has come to declare the Muslims to be unbelievers.” The same false propaganda that you hear and see today from half-baked academics and tabloid journalists. The Sufis and Raafidah say, “The Salafis hate Muhammad (ﷺ), they doesn’t make du’a for the Muslims, they don’t believe that you should make du’a for the deceased, they liken Allah to the creation, they don’t respect the four Imaams…” and so on from the false accusations. All of these lies they invented against Shaykhul-Islaam Muhammad Ibn Abdul-Wahhab (rahimahullaah) which he refuted in his own time with his own pen, but which are still present today upon the tongues of the misguided innovators and dull-witted academics. Shaykhul-Islaam Ibn Abdul-Wahhaab continued writing various books and treatises, and letters to the rulers of various places, informing them that the lies that they were hearing were all false, making clear to them his ‘aqeedah: “This is the ‘aqeedah of Imaam Abu Haneefah, this is ‘aqeedah of Imaam Ash-Shaafi’ee, this is the ‘aqeedah of Maalik, this is the ‘aqeedah of Ibn Hanbal, and their ‘aqeedah is my ‘aqeedah!” He wrote it, penned it down and sent it to their places, so why now should Ahlul-Bid’ah lie about him? When they accused him of making takfeer of the Muslims, he would say: By Allaah, I do not declare the Muslims to be kuffaar; and I do not state that a person has left Islaam due to a sin they committed; and I declare that a person has not exited the fold of Islaam except with the certainty that he had entered the fold of Islaam. They spread a rumour about him, that he said, “Whoever does not make hijrah to me in Dir’iyyah, then he is a disbeliever!” He said, “By Allaah! Even if we saw a person prostrating in front of the grave of Ahmad Al-Badawee in Egypt, we would not make takfeer of him up until the proof is established upon him!” Meaning: it must be as clear as the sun in the sky that the person has committed major polytheism and he is aware of that. So when we enter into this book (Kitaabut-Tawheed) now, you will come to realise that they maligned his character unjustly and they spoke about him unjustly. This was an Imaam of the Sunnah, a Mujaddid (Reviver) of his time, a reviver of the Religion, in a time of darkness and misguidance. The people were living in darkness in terms of knowledge and they were opposing the Qur’aan and the Sunnah in their beliefs and actions. And even after Muhammad bin Abdil Wahhaab died in 1206 (rahimahullaah) the da’wah continued and it spread across the world, it spread to India and elsewhere – and Tawheed was spread in India, taken from the students of Shaikh Ibn Abdul-Wahhaab, and from the da’wah and the letters that reached there. Likewise in Yemen, in Egypt and elsewhere – but the enemies did not stop. And when the Ottomans eventually came, they destroyed Dir’iyyah and killed its’ people, they exiled the children and grandchildren of Shaykhul-Islaam – they executed the grandson of the Imaam Muhammad bin Sa’ood (rahimahullaah). Who did that? The proxy army of the Turks, of the Ottoman Empire, under the leadership of Muhammad Ali Pasha. They executed many of the scholars, they killed them and some of them they took back to Turkey, to Istanbul. From them was the grandson of the Imaam Muhammad bin Sa’ood, and they executed him there after debating him by putting so-called ‘Hanafi scholars’ in front of him, they weren’t Hanafi scholars, they were Quboori, grave worshippers and Soofis. They would debate with him but they were not able to debate with him due to his knowledge and he was the ruler. This is a ruler who had more knowledge than their scholars! So eventually they executed him and they chopped his body into pieces, limb by limb and they put each limb upon the paths leading into Istanbul to show the glory of their empire. The Da’wah of Shaykhul-Islaam Muhammad bin Abdul-Wahhaab entered into Hijaaz, when it had entered into the Hijaaz, Makkah and Madinah, that’s when they felt threatened, so they came and they annihilated it. 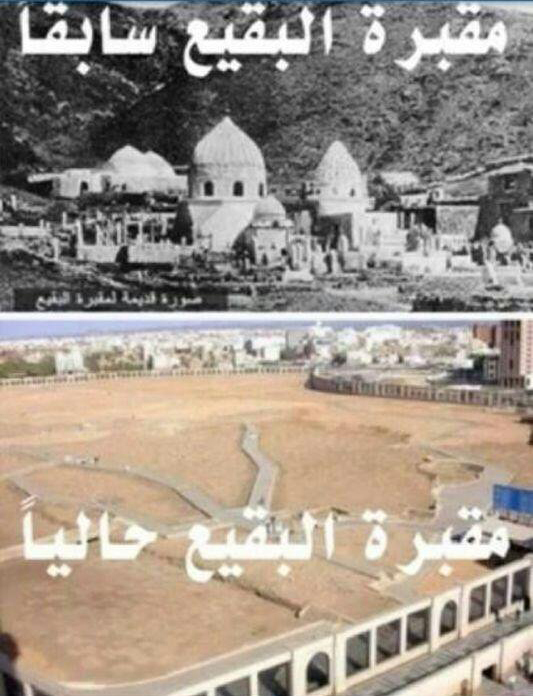 The Baqee graveyard in Madinah: before and after the 3rd Saudi State. Ibraheem Pasha was sent to Dir’iyyah to demolish the Salafi State. Shaikh Muhammad b. Ibraaheem Aalush-Shaikh (rahimahullaah) stated in the introduction of Tayseer al-Azeez al-Hameed (p. 13), that Ibraaheem Pasha brought along with him singing women, musical instruments, alcoholic drinks. Also French military officers, English naval officers were present, as well as Italian physicians. Not once was the Adhaan heard from their encampment! They dragged Shaikh Sulaimaan b. Abdullaah (the grandson of Shaikhul-Islaam Muhammad Ibn Abdul-Abdul-Wahhaab) in front of Ibraaheem Pasha in 1233H (1818CE) whilst there was the playing of musical instruments and singing. The Pasha’s hatred and desire to humiliate this scholar led him to take him out to the graveyard. Once there, he ordered the soldiers to stand surrounding the Shaikh with rifles pointed towards him. Then he commanded every soldier to fire one bullet each into the Shaikh’s body. The Shaikh’s body was torn to shreds. Shaikh Sulaimaan was 33 years old when they killed him (rahimahullaah). The soldiers were then commanded to gather his flesh and limbs together. Then Ibraaheem Pasha came to the father of Shaikh Sulaimaan (rahimahullaah), to Imaam Abdullaah b. Muhammad b. Abdul-Wahhaab (the son of Shaikhul-Islaam) in order complete the hatred and rancour he had in his wicked heart. He intended to humiliate Imaam Abdullaah and hurt him with news of his son’s murder: “We have killed your son.” So the patient and righteous father (rahimahullaah) responded: “Even if you had not killed him, he would have died.” So they demolished the first Saudi State with oppression and killing, those acting on behalf of the Ottoman Empire. Then, within a few decades, they returned again and the da’wah continued again, then it was demolished again and then it returned back at the beginning of the 20th century, under the leadership of the King, the Imaam ‘Abdul Azeez Aali- Sa’ood (rahimahullaah) who is the father of the present King of Saudi Arabia – and indeed all the previous kings since 1953. He was a Salafi, make no mistake, King Abdil-‘Azeez (rahimahullaah), the founder of the current state of Saudi Arabia, which is the third state, was a Salafi upon the Sunnah. When they came into power, there were Soofees in charge, that were worshipping graves in Makkah and in Madinah, they had four pulpits in Makkah and they used to pray the prayers, every group from the Madhhabs behind his own imaam in prayer. Hanafis behind the Hanafi, Maalikis behind the Maaliki, Shaafi’ees behind the Shaafi’ee, etc. All types of innovations, superstitious practices and grave-veneration were taking place. When they would replace the covering of the Ka’bah yearly, they would have dancing women and music other sins taking place. So the Saudis abolished all of that and they made the prayer in Makkah and Friday sermon behind one imaam and they stopped the innovations. The Baqee’ graveyard in Madinah was filled with tombs, shrines and structures over the graves. The Saudis came and demolished those and levelled the graves of the noble Companions of Allaah’s Messenger (ﷺ). 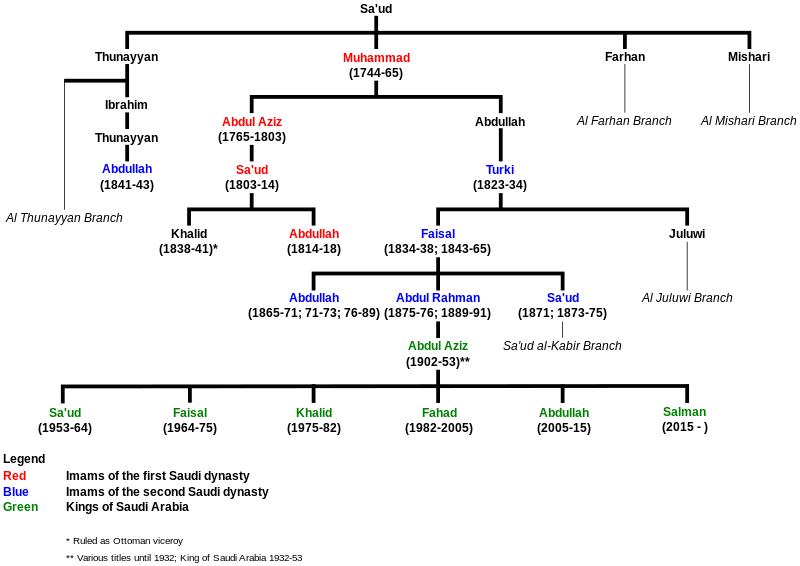 The House of Saud through the three Saudi States. So they established the Sunnah of Allaah’s Messenger (ﷺ) wherever they were able to – and the Kingdom of Saudi Arabia from that time remains till this time, walhamdulillaah – may Allaah preserve it. We say the rulers from King Abdul-‘Azeez (rahimahullaah) who died in the 1953, and his sons who have been the rulers of the Kingdom of Saudi Arabia till this day, that they profess that they are upon Salafiyyah and that they are upon the ‘aqeedah of the Salaf. It is not permissible to revolt against them, to revile them or to speak publicly against them, rather it is an obligation upon the Muslims to supplicate for them and aid them in rectifying the affairs. And that is the conduct that agrees with the ‘aqeedah of ahlus-Sunnah wal-Jamaa’ah and that which the early generations were upon: that we supplicate for the rulers, we do not rebel against them, we do not speak openly against them and upon that belief there is ijmaa’ (consensus) from the Sahaabah, from the Taabi’een, from the Atbaa at-Taabi’een. So this is the place where we will now begin, inshaa’ Allaah, the first chapter of Kitaab at Tawheed. Now you know the man who wrote this work – may Allaah shower him with mercy. The above was a summarised transcript of a lecture by Abu Khadeejah. May Allah reward the sister who transcribed it. My suggesting If you expand it with some examples and explanations and after that make it as a book I think it would be more helpful.